Hello Kitty DS Game - Special Double Offer! Buy the New Hello Kitty DS game, Hello Kitty Birthday Adventures, for $24.99 and receive 20,000 Sanrio Loyalty Points to be used in Hello Kitty Online! Click here to read the details and order now! Submit smart ideas about saving energy now! Hello everyone! Hello Kitty Online will hold the Trash Busters event in April. During this event, SanrioTown opens a forum dedicated to collecting smart ideas from everyone about smart ways to save energy for the environment’s future. Selected smart ideas will be posted on SanrioTown’s home page, so don’t miss the opportunity to share your great ideas with the world! Click here to share your ideas now. HKO Arcade Superstars winners announced! The winners of our recent minigame competition HKO Arcade Superstars have just been announced! During the event, players flocked around the Minigame Managers for seven days, competing for the high scores in our 30 new minigames. The spotlight is now on those who’ve earned the top 3 scores for each minigame. So click on a link below to see the list of Arcade Superstars in each region! Check the announcements for details regarding prizes and rewards. Congratulations to our Arcade Superstars! This definitely won’t be out last minigame event, so keep practicing and stay tuned for our next event! HKO Trash Busters: Celebrate Earth Day 2010! Join Hello Kitty and her friends in a special Earth Day event on April 22 to April 26, 2010! Earth Day promotes awareness about what we can do to take care of our planet. As the world celebrates Earth Day, there’s trouble in Hello Kitty Online – trouble of a messy kind! Who will save the day? The Sanrio characters need your help to clean things up and make Earth Day special, so read on to find out more! A naughty Litterbug is roaming near Florapolis, dropping piles of litter along its trail. It’s up to you to clean up after it, so gather up the litter from these piles until they’re all gone. You can find the Litterbug walking back and forth between Florapolis, East Florapolis Valley, and South Dream Forest. Form a group with your friends to try to stop the Litterbug in its tracks, and you might be able to take all the litter away from this mischievous bug. Be sure to keep all the litter you gather! You can give litter to Badtz-Maru for recycling, or give it to KeroKero Keroppi in exchange for cool rewards. The more litter you have, the better your rewards! KeroKero Keroppi, Badtz-Maru and Cinnamoroll are spreading the word about Earth Day. You can find all of them in Sanrio Harbour. Each day they will offer a new set of quests, so check with them and see how you can contribute - they will reward your efforts generously! The big challenge during Earth Day is hidden in a secret area tucked away in the woods of Sanrio Harbour. The secret area can only be accessed through an entrance beside Badtz-Maru (only available for the duration of this event). The entrance leads to a farm that used to be lovely and full of rare plants, with a greenhouse once renowned for its colorful flowers. Sadly, the entire farm is now covered in trash, and the monsters inside are preventing anyone from cleaning it up. Talk to Badtz-Maru and check the list of items that he needs for the XT-Greenifier. Each item is assigned a certain number of contribution points (item value). Gather as many of the items as you can, but try to focus your efforts on items that are worth more points. The item values change every day based on contributions from the previous day. Give the items to Badtz-Maru, and encourage all your friends to do the same. When enough items have been submitted, the farm will become noticeably cleaner and a surprise will await players in Sanrio Harbour. The more items you give, the faster the XT-Greenifier can finish the job, so hurry before the path to the farm disappears at the end of April 26, 2010! It will take quite some effort to see this farm cleaned up. Once the farm and greenhouse have been restored, special plants will appear inside. These rare plants yield special seeds that are only available through this event - it just goes to show that if we take care of our environment, it will take care of us too! We hope you enjoy celebrating Earth Day with us. Good luck and have fun! April Downloads are now available! Hello everyone! April downloads are now available at SanrioTown! Download cool wallpapers, desktop icons, emoticons and screensavers especially made for April! Just log in to your SanrioTown accounts and go to the downloads section to grab ‘em all! Click here to go to SanrioTown’s download page. New Hello Kitty Facebook App has been launched! Hello Sanrio Fans! We’ve just released a new quiz in facebook called "Are you good at starting relationships?" It’s a cool quiz that tells you how you usually express your feelings towards someone else. The quiz has a cool way of presenting to you its questions and it’s really fun to use even if you already received your first result. Want to try the newly-launched app? Log in to your Facebook account now and go to this link. Hello Kitty in MXR’s 3D tech! Experience Hello Kitty interaction at the palm of your hands! Powered by MXR Corporation’s Web3D technology, you can now make Hello Kitty walk on your desks, hold her in your hands and do other cool interactions with her! Sounds cool? All you need is webcam. Watch the video for more details on how to install the software on your PC! Before anything else, we would like to give a heartfelt thank to everyone who joined the event. It wouldn’t be a successful one and it wouldn’t be fun if not for everyone’s participation. A total of 637 guests clicked "attending" in our Facebook page. For the winners: we will send you instructions to your SanrioTown email account on how to claim your prizes. Congratulations! What is the Item Mall? The Item Mall in Hello Kitty Online is a place where players can buy in-game items that are not usually available in the in-game stores. 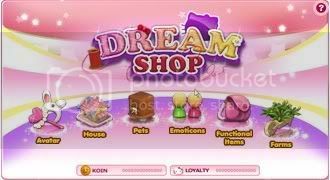 Items can be purchased using either Sanrio Cash Points (SCP) or Sanrio Loyalty Points (SLP). SCPs have to be purchased, but SLPs are very easy to get. You earn SLPs every time you use SanrioTown’s free online services (blogs, videos, forums, etc.) and by playing HKO. To know more about how to earn SLPs, please visit this page. In the Item Mall, you can dress up your avatar from head to toe. Choose from a huge selection of swanky clothes, stylish headgear, cool equipment, and fun customization options like facial expressions, hair, skin tones, accessories, etc. Be sure to check back for new items regularly, especially during an event! The HKO Item Mall also sells exclusive land certificates and pets that are not available anywhere else. You will be able to build your favourite house and choose from a wide range of limited edition pets that cannot be obtained in-game. With these in your possession, you’ll definitely stand out in a crowd! Discounts – HKO will be discounting stocks in the Item Mall so do check out the items there from time to time even if you’re short on SLPs. Who knows, an item you really want could be on sale! Gifting items – you will be able to send gifts from the Item Mall to your friends! Limited edition items – During many HKO events, there will be Item Mall exclusive items on sale. After the event is finished, these items will no longer be available for purchase but will be considered as permanent items in your inventory if you’ve purchased them. Want to shop for items now? Play the game and click on the Item Mall icon located near the bottom of the sidebar! You are currently browsing the Kitty News Blog weblog archives for April, 2010.